Eurocopter designs all of its helicopters with fenestrons, which are tail rotors enclosed in ducts in line with the fuselage, to make their tail rotors quieter and safer. The tail rotors of most other manufacturers' helicopters are mounted on the side of the rear fuselage and so represent more of a safety hazard. The fenestron on this Eurocopter EC 155B1 medium-sized civil helicopter can clearly be seen. 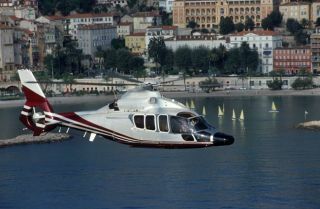 The aircraft is pictured flying over the Mediterranean Sea at Menton on the border of Provence in southern France and Liguria in Italy. Many peoplehave never flown in a helicopter and consider them playthings of the rich. Butthese vertical-takeoff, vertical-landing aircraft impact our lives in many surprisingways. "Thepublic isn?t aware of all the things helicopters do that affect their lives ona daily basis," said Matt Zuccaro, president of the Helicopter Association International (HAI). Anyoneliving in a big U.S. city is used to the sight of news and police helicoptersbuzzing around and knows helicopters are used in search-and-rescue operations at sea and on mountains. But fewer people, perhaps, are aware ofthe major part helicopters play in providing pemergency medical services and in fighting forest fires. People knowthat top executives often fly in helicopters, but they may not realize thesignificant economic benefits that helicopters create by improving businessproductivity, said Zuccaro. Intensiveuse of helicopters by the offshore oil community also benefits the public. "Helicopters provide a major contribution to the oil industry in producingand delivering in a timely manner the petroleum products that we use everyday," said Zuccaro. They canhave a positive environmental impact. The U.S. timber industry often uses largehelicopters such as the Boeing 234 Chinook to lift logs from remote sites,"obviating the need for cutting logging roads," he said. But theirability to take off and land vertically in city centers or inaccessible placescomes at a price. Helicopters are noisy, relatively slow and fuel-hungry. Theyare expensive to operate and haven't yet proved suitable for city-to-cityservice. However,the helicopter industry is working on new technologies and operationalprocedures to make its aircraft more community-friendly and efficient. HAI's"Fly Neighborly" program, used successfully in New York for years,ensures that helicopter operators consult with communities to locate heliportsand develop routes in ways that minimize the environmental impact of theiraircraft. One area inwhich manufacturers are concentrating their technological development effortsis in reducing the aerodynamic noise made by helicopters' main and tail rotors.Aerodynamic noise is responsible for most helicopter noise that people on theground hear. Manufacturersare now designing new helicopters with four or more main rotor blades. Thisavoids the distinctive chopping noise that the older, twin-bladed Bell UH-1"Huey" helicopter makes, which can be heard miles away. Meanwhile,Eurocopter uses a technology called the "fenestron" to reduce thenoise made by tail rotors. The tail rotor produces a small portion of ahelicopter's lift, but its main roles are to prevent the helicopter's fuselagefrom spinning around (by counteracting the torque produced by the main rotors)and to provide side-to-side control of the aircraft. Thefenestron is a tail rotor enclosed within a duct and positioned in line with the fuselage. This reduces noiseand improves safety. Eurocopter also spaces its helicopters' tail-rotor bladesunevenly, reducing "phase modulation" effects to make the tail rotorsquieter and more pleasant-sounding. Manufacturersare now using composite materials in helicopter fuselages and rotor blades tomake their aircraft lighter and more fuel-efficient. But what preventshelicopters from going faster is "retreating blade stall." In atraditional helicopter, the main rotor blades revolve horizontally around acentral point and move forward and backward during each revolution. Theyproduce most of the lift and all of the thrust that moves the aircraft. When thehelicopter reaches a certain speed, its forward movement negates the liftproduced by the backward movement of each rotor blade, causing the blade tostall. That speed -- which varies depending by helicopter model but usually is lessthan 200 mph -- represents a speed barrier. However, ina tilt-rotor aircraft such as the Bell/Agusta 609, the main rotors becomepropellers. The retreating blade problem disappears and the aircraft can flymuch faster. Activeblade control is also being studied closely. This technology seeks to controlindividually the angle at which each rotor blade meets the air during each partof the rotation cycle, rather than controlling the angle communally by means ofa "swash plate" attached to the rotor hub, as happens now. Anotherapproach, being flown experimentally by Piasecki Aircraft on the X-49A (amodified Sikorsky UH-60 helicopter) is to make the tail rotor a "vectoredthrust ducted propeller" that faces aft and drives air past a rudder andtailplanes. This airprovides thrust to move the helicopter, provide vertical lift, counteract the main-rotortorque and allow the rudder and tailplanes to control directional stability. Most U.S. helicopter flying is performed at altitudes below 5,000 feet and outside the NationalAirspace System. HAI is working closely with the FAA to install new ADS-Bnavigational and traffic/terrain-avoidance equipment in all oil-support helicopters operating in the Gulf of Mexico, anarea in which most airspace is not radar-controlled. Similarinitiatives will follow in Alaska and Hawaii. By means of this and otherinitiatives, HAI hopes to reduce the worldwide helicopter accident rate by 80percent within a decade. Increasingly,organizations are realizing the benefits helicopters can offer. At the recentHeli-Expo show in Orlando, nearly $700 million of orders were placed. "Theindustry is extremely healthy," said Zuccaro.